The Agency for Eternal Justice has been selected as the winner of the May 2014 Paranormal Spotlight! We are very excited about this opportunity for exposure. We have been featured weekly on their radio show, which can be found online at http://www.vegasallnetradio.com/othersidez.html. 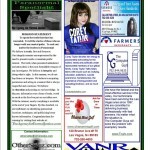 We are also featured in their May newsletter, which has a multitude of followers!